WE HAVE NOW ADDED A LIMITED NUMBER OF SEATS TO EACH PERFORMANCE. ACT NOW — THEY ARE GOING FAST! Dupont Underground — the subterranean streetcar station-​turned-​arts organization beneath Dupont Circle — will return to its transit roots this spring when local feminist theatre company Pinky Swear Productions brings the world première of local playwright Brittany Alyse Willis’s Use All Available Doors to the wildly popular venue. The production is made possible by a generous grant from CulturalDC’s Performing Arts Program. The station hasn’t been used for transit since 1962, but is an appropriate stage on which to celebrate WMATA’s Red Line and the value it brings to Washington, DC. Use All Available Doors follows a soon-​to-​be-​decommissioned WMATA train car, a grieving operator re-​evaluating her life’s path, and a revolving door of passengers as they travel the length of the Red Line from Shady Grove to Glenmont. A vignette occurs between each stop, highlighting the diverse nature of the path of the Red Line, including a parade, a sing-​a-​long, and unsolicited foot washing (that one’s a true story), as the train operator, Sherry, reflects on her memories of her mother and her beginnings at WMATA. The production will be performed on Dupont Underground’s real tracks and feature seats made from WMATA-​donated cushions from a scrapped 4000-​series car. Pinky Swear is actively reaching out to the community in the hopes that the play will reflect the wide array of people who live and travel along the Red Line — the oldest and busiest line in the system, which includes 27 stops located in Montgomery County, MD, and Wards 1, 2, 3, 4, 5 and 6 in the District. To that end, the production team is holding pop-​up events at various Metro stations, encouraging riders to share their real-​life stories via postcards. The play opens on Friday, April 13, 2018, at Dupont Underground (19 Dupont Circle NW), with shows Thursday through Sunday running until May 6, 2018. For more information on Use All Available Doors and Pinky Swear Productions, visit http://​pinkyswear​-pro​duc​tions​.com/​u​p​c​o​m​i​n​g​-​p​r​o​d​u​c​t​i​o​n​s​/​u​a​a​d. 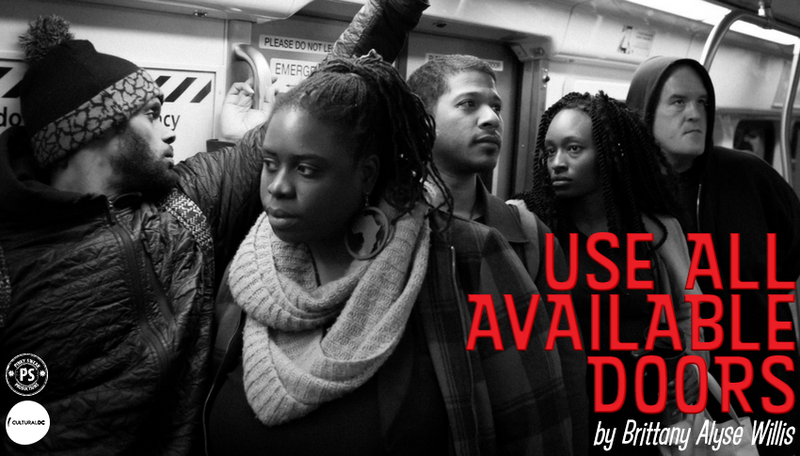 Through a generous grant from CulturalDC’s Space4: Arts program, the world première of Use All Available Doors will be presented on real train tracks in Dupont Underground, the über-​popular downtown subterranean trolley station-​turned-​arts and culture space! Give us your feedback! Fill out our brief online survey—we’d love to hear more about your experience as a Washingtonian! Work with us! Interested in working with Pinky Swear on Use All Available Doors or future projects? Contact toni@pinkyswear-productions.com. If you’re interested at all, feel free to reach out. Host us! Interested in co-​hosting or featuring us at an event or panel? Got thoughts on how we can collaborate to promote DC-​based art or support our community? Let us know! Contact toni@pinkyswear-productions.com. Follow Us! Help us get the word out about the show and build a community around it by finding us on Facebook, Instagram, and Twitter. Support us! Help us make Use All Available Doors a reality with a tax-​deductible donation to Pinky Swear. For press questions and interviews please reach out to john@pinkyswear-productions.com. Brittany Alyse Willis (Playwright) is a DC-​based actor, graphic designer, and playwright. They have written plays produced in Chicago, DC, Massachusetts, and Texas and published poems with Apropros Literary Journal and shufPoetry. They like theatre that winks at you from behind the curtain. You can catch find examples of their work at brit​tanyaw​illis​.com. Toni Rae Salmi (Director/​Community Engagement Conductor) has been a company member of PSP since 2011. An actor, cabaret artist, and director, Toni Rae hopes to add “arts manager” to her resume; she is currently pursuing her Master’s Degree in Arts Management at American University. John Bavoso (Marketing Conductor) is a DC-​based playwright, book/​theatre reviewer, and marketing professional. His plays have been produced and/​or developed in DC, Virginia, New York, Colorado, Texas, California, Florida, and Sydney, Australia. His passion is bringing a touch of creativity, humor, and whimsy to everything he writes. More info at john​-bavoso​.com.